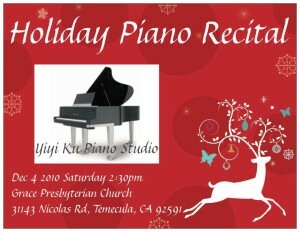 The next studio recital will be held on Dec 4 at the Grace Presbyterian Church in Temecula. 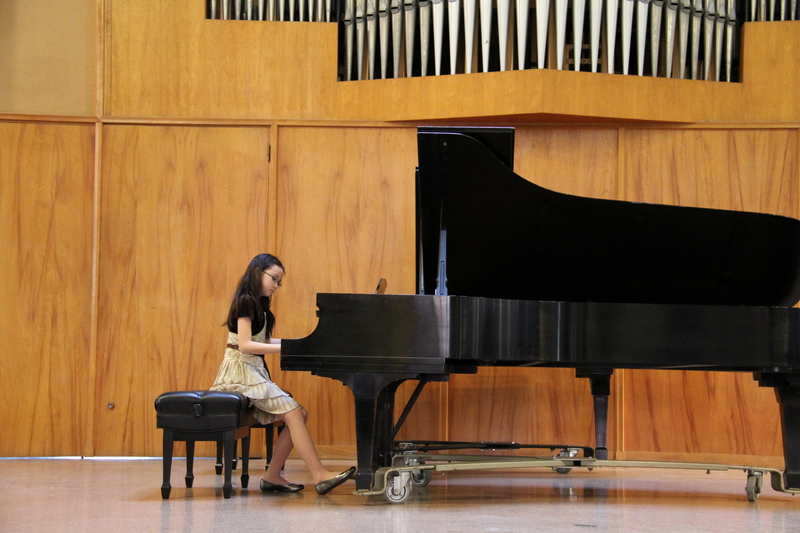 The recital will start at 2:30pm and will finish by 4pm. The registration fee is $15 per student. All student performers will receive a Certificate of Performance. Registration deadline is November 5. To register, please fill out the following form and include your recital registration fee with your November monthly tuition. If your regular private lesson is on Thursday, your lesson on Nov 25 will be rescheduled. I will email reschedule options individually. If your lesson falls before or after Thanksgiving, and you need to reschedule, please contact the studio immediately. The usual monthly tuition applies. There will be no lessons from Dec 23 – Jan 11. All lessons will resume on Jan 12, 2011. The monthly tuition for December and January will be adjusted. Invoices will be emailed individually. Copyright © 2019 Yiyi Ku Piano Studio Murrieta Temecula.